Seventy-three teams, representing Japan's top 470 talent, qualified to compete in the 2015 470 All Japan Championship hosted at Sakaiminato Marina, from 17-23 November 2015. Participants included twelve women's teams and forty-five junior teams, under the age of 24. 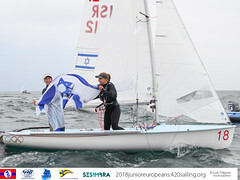 An intense 9 race opening series saw every condition thrown at the sailors, from light breeze to full-hiking over waves. The top ten teams faced off in the double-points medal race on Monday 23 November. Patience was called for, as an overnight storm gave way to a mirror-like sea, leaving the Race Committee and teams waiting for the breeze to kick in. 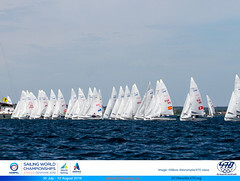 Eventually a soft and shifty breeze of around 5 knots filled in, enough to get racing underway. 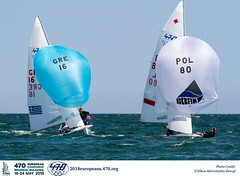 A win in the medal race for Tetsuya Isozaki/Toshio Futagami accelarated them up the leaderboard to fourth overall. A second place, consistent with their form throughout the week, easily gave victory to Kazuto Doi/Kimihiko Imamura.The pair racked up 7 wins from the 9 opening races, with their worst placed finish being a third, to end the series with a significant 19 point advantage over second placed Naoki Ichino/Takashi Hasegawa. Third overall and top women's team were Ai Kondo Yoshida/Miho Yoshioka. A great result for Kazuto Doi/Kimihiko Imamura, who successfully defended the title they won last year. Up next for them and many of the Japanese 470 teams, will be the Copa Brazil in Rio in December, then ISAF Sailing World Cup Miami in January 2016 and the 2016 470 World Championships in Argentina in February. Tetsuya Isozaki/Toshio Futagami and Ai Kondo Yoshida/Miho Yoshioka have already been selected to represent Japan at the Rio 2016 Olympic Games in the 470 Men and 470 Women events respectively.